The whisper-quiet MiniVent 1000 is the smallest and most economical solar vent in the Nicro line. It is an exhaust vent only, but it will keep the boat cabin cool when you need it most - during the hot sunlight hours. Under solar power, the Mini Vent 1000 will move 700 cubic feet of air an hour. At night, even a light breeze will continue to ventilate the boat passively. 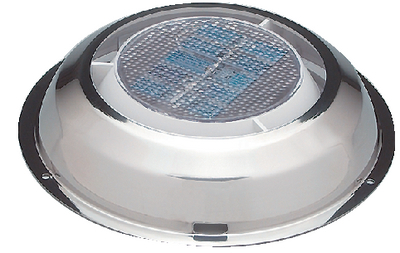 Built-in shut-off damper prevents water intrusion in rough seas. Fits a 3-3/4" installation hole. White ABS w/SS cover. Includes a 2-year limited, 5-year qualified warranty and mounting hardware.